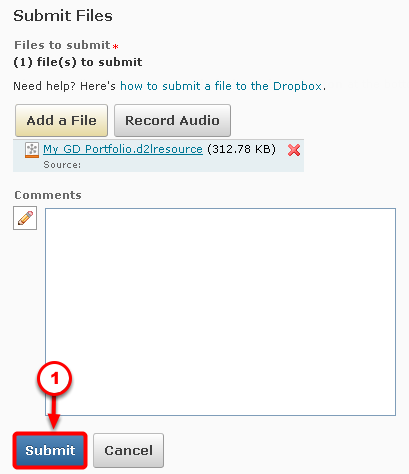 Have access to a D2L Dropbox Folder that your instructor has been made available to you. If you have not already done so, log in to D2L (http://d2l.uwm.edu) using your ePanther ID and password. Go to your D2L course site by clicking on the name of your course. Once you are in our course, click on [Dropbox] in the upper navigation bar. Select the appropriate Dropbox Folder. Click the [Select Item] button. 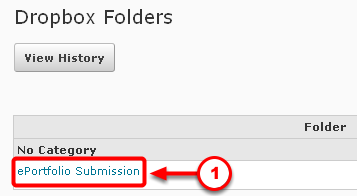 Once you return to the [Submit Files] window, click the [Submit] button. You will receive verification of your completed submission with a record of the time and date. To close the [Submit files] window, click [Done]. 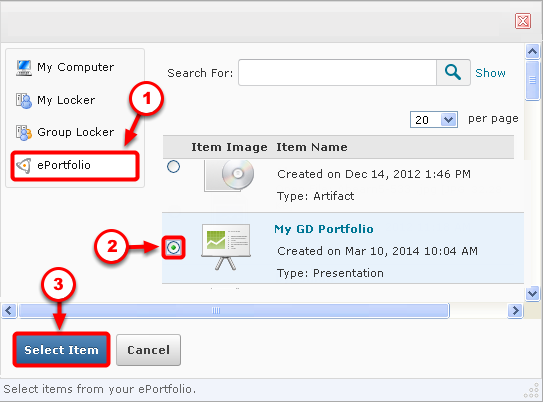 It is imperative that you check that your ePortfolio Presentation has attached properly. 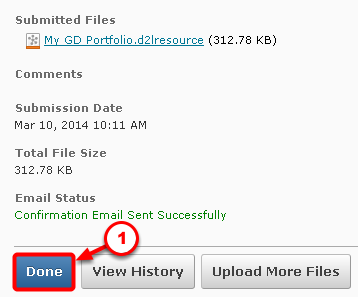 To do this, return to the Dropbox folder in which you originally submitted. Under [Submissions], click the blue number (this indicates the number of files you submitted to this folder). Check whether the file is over 1 Kilobyte. If the file is LESS THAN 1000 Bytes, the Presentation has not attached properly. Check whether YOU can view the Presentation, by clicking on the .d2lresource file link. Once the link is clicked, a new window will open, if your Presentation DOES NOT appear and the new window displays a blank white page, the Presentation has not attached properly. If your Presentation DID NOT attach properly, please try to submit your Presentation again, using the steps above. Be sure to use FireFox or Chrome as your browser. You may also want to try uploading using a high speed, wired ethernet connection after 8pm in the evening when internet traffic is not as high.